When you visit a museum, the last thing you want is a NO ACCESS sign or a barrier that prevents you from viewing an exhibit. And human nature being what it is, being told Don?t touch or Keep out often encourages you to do just the opposite. 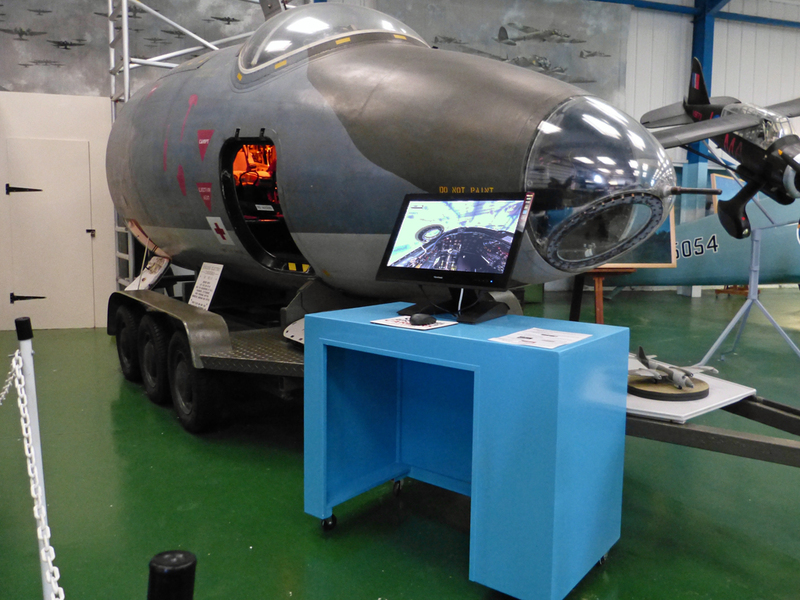 The Tangmere Military Aviation Museum has a rare aircraft on display: A cold war, early jet age bomber, the English Electric Canberra. 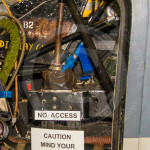 The door to the aircraft is normally open, but it?s NO ACCESS. On the right there is a dark tunnel to the bomb-aimer station. On the left is a dark and narrow passage leading to the navigator?s station ? which is out of sight. Ahead is the cockpit ? but only the area where the pilot?s feet would have been is at eye level. The Canberra is a bomber, not an airliner. It was designed for air crew wearing helmets, not for visitors who would bang their heads (and other body parts) left, right, and centre. NO ACCESS. There's a lot to see inside. If visitors could climb in, they'd ask a lot of questions about all the strange, unusual, and interesting things surrounding the pilot, navigator, and bomb aimer. To answer all the questions, one of the friendly and knowledgeable volunteers who run the museum would have to climb inside the fuselage as well ? perhaps too close for comfort, for both visitor and volunteer! Technology comes to the rescue ? 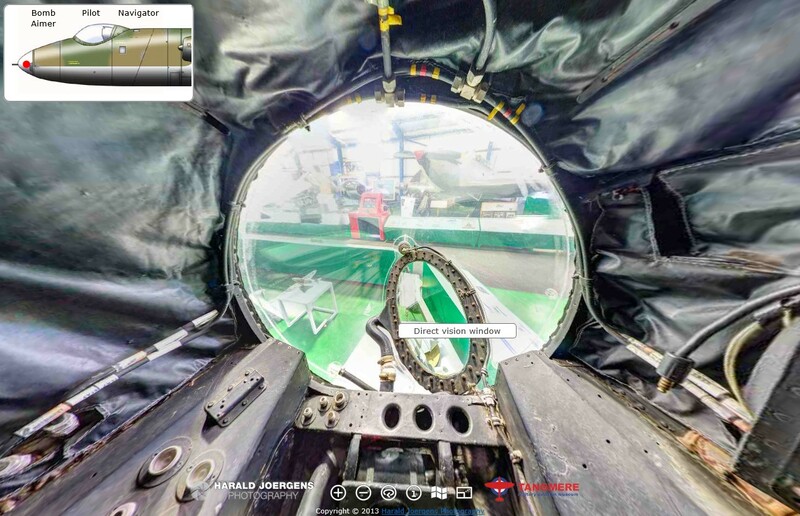 a virtual tour. It?s a combination of interactive panoramas (often called 360 panoramas or 360? panoramas). The viewer can use a little ?map? to switch from one panorama to another, or use visual links that make the switch very intuitive. A console is placed outside the aircraft, with a normal desktop computer built in. With just a 27? 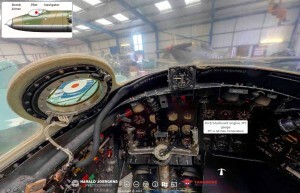 monitor and a mouse, visitors can now explore the inside of the aircraft in great detail. Even if they are wheelchair bound. The computer is configured to run the virtual tour, and nothing else. Visitors can virtually ?move around? between the cockpit, the navigator station, and the bomb aimer station. The open door of the aircraft, next to the console, ties the virtual and the real world together. Shot from the pilot?s eye level, the interactive cockpit panorama puts the viewer, virtually, on the pilot?s seat. Unlike a real pilot, the viewer can look in any direction, and zoom in on any detail. There is tnformation about 130 different items, thanks to the museum?s volunteers who collected and verified all the details. 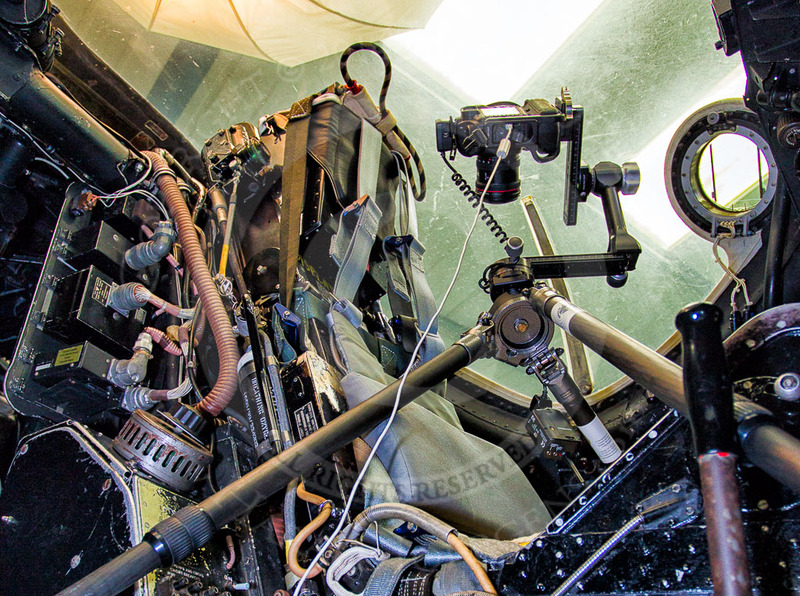 The aircraft door was attached again, and closed for a part of the photography, to make the panorama more ?aircraft? than ?museum exhibit?. 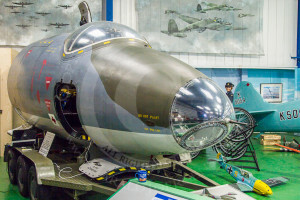 Behind the cockpit is the navigator station, with an ejector seat for the navigator on the left, and an ejector seat for the bomb aimer on the right (when not in the nose of the aircraft). This area used to be almost completely dark ? there was nothing to see, ?no access? for visitors. For the navigator panorama work the museum brought the aircraft?s electrical systems, and internal lighting, back to life. They even found a 1950s military aviation map for the map table. Information about 125 items is available on a mouse move. In the nose of the aircraft is the bomb aimer station. Not part of the original design, it was added when the planned bombing radar was not ready for production. The bomb aimer had to leave his ejector seat in the rear, and then crawl through a narrow tunnel on the bottom of the cockpit front into the nose of the aircraft. The area used to be in the dark and out of sight for visitors. 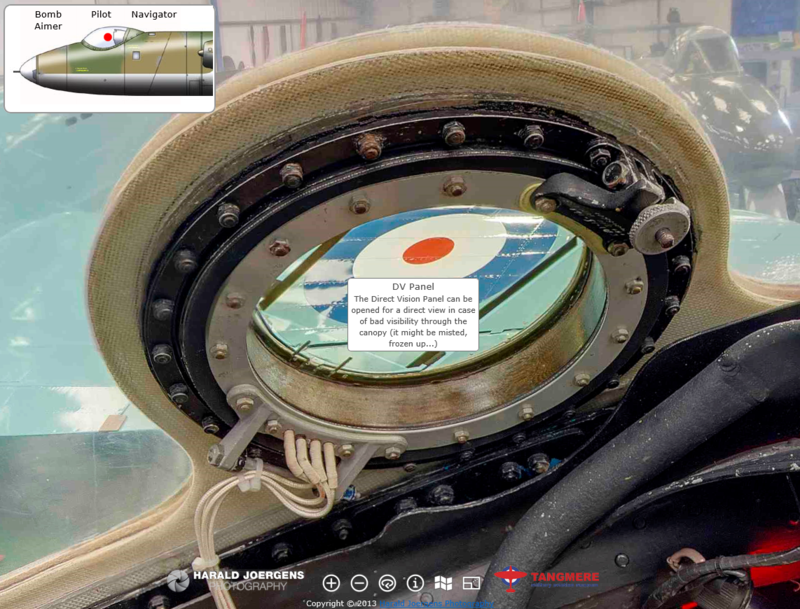 It?s a narrow and very confined space, but the bomb aimer panorama gives the viewer an idea of the real bomb aimer?s field of view. A 360 panorama is based on photos that cover overlapping segments of the complete area around the camera. To put the theory into practice, it needs a solid tripod, a panoramic head assembly, and a computer to remotely control the camera. The sound of the Rolls Royce Avon RA7 turbojets has been provided by Just Flight. Starting an engine in a Canberra (as in allmost all aircraft) means a few more steps than just pressing an "engine start" button, but for the virtual tour, one of the two engine start buttons will fire up the engine. On the bottom of the dashboard, left and right of the control column, are the engine switches. On the very left is the Port Engine Master Switch, followed by the Starboarf Engine Master Switch. The switches closest to the left and right of the control column are the ignition switches, next to them are the actual engine start switches. They are shielded - it would be an expensive mistake trying to start an already running engine. The resulting virtual tour - click on the logo to start! ?Click here if you are using a smartphone or tablet? "Meeting the natural desire to sit in and experience the cockpit of a displayed aircraft raises the twin problems of physical access and the demands of conservation. The incredible panoramic 360 cockpit view of our?Lightning?and Canberra cockpits, created by Harald Joergens, removes both problems at a stroke. 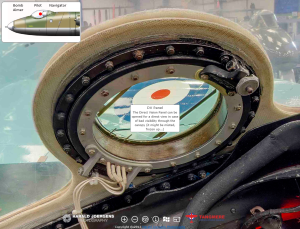 Our visitors are now able to see, and examine in detail, every aspect of the respective cockpits using the interactive displays adjacent to each aircraft." 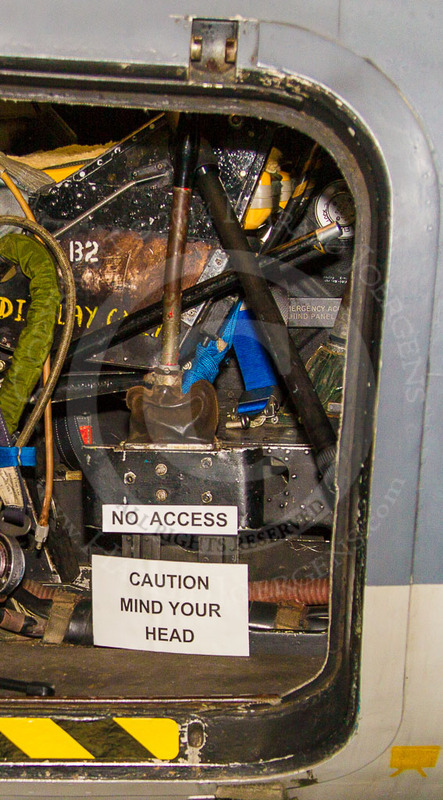 "Harald Joergens ARPS was tasked by the Museum to deliver the software that would enable our visitors to see the interior of the three cockpits of a Canberra B2 and the cockpit of a Lightning, without entering the aircraft. He spent five days at the Museum photographing the inside of the three cockpits and then produced the software to enable the Museum to set up on a purpose built console, a monitor screen showing cockpit views. 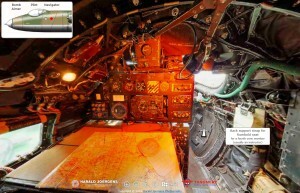 The visitor is able by the use of a mouse to navigate around each of the cockpits and to zoom into selected aircraft instruments when desired. The software also enables the aircraft instruments and items in the cockpits to be labelled. It was a real pleasure working with Harald on this unique project and we are delighted with the result." The English Electric Canberra, or Martin B-57 Canberra in the U.S., was a medium bomber of the early jet age, designed to be able to fly higher than the fighter aircraft of the time. Canberras have been in service will air forces all over the world from 1951 to 2006. The aircraft at the Tangmere Military Aviation Museum is a Canberra B.2, delivered to the RAF in 1952, where it served in various squadron for almost 40 years. It has been stationed, with 245 Squadron, at Tangmere in the early 1960s.